George Zimmerman, 28, faces second-degree murder charges in the death of Trayvon Martin in Sanford, Florida, on February 26. (CNN) - Trayvon Martin's girlfriend, talking to him on the telephone, heard the teenager saying "get off, get off," in the moments before his cell phone cut off and he was shot dead, according to a recording released Friday of the girl's interview with a prosecutor. Another witness, however, seems to put Martin on top of George Zimmerman for at least part of the struggle, according to another recording. "Where I first walked out there, the black guy was on top, and the only reason I can tell that was because the guy that was on the ground under him at that point wrestling was definitely a lighter color," the witness, whose name has not been made public, said in the interview. Martin was African-American. Zimmerman is a white Hispanic. Another witness said the heavier of the two appeared to be on top. "I know after seeing the TV of what's happening, comparing their pictures, I think Zimmerman was definitely on top because of his size," the witness said. The recordings provide the most detailed look yet into previously reported witness statements detailing the last moments of Martin's life. It doesn't matter, they can come out with new evidence until this time next year but, it doesn't change what he did so, why is it that it seems like every day, they keep coming with new evidence? The picture of Zimmerman with all the blood in the back of the head clearly shows that he was on TOP of Trayvon. If his head was being bashed repeatedly to the ground, the blood would flow towards the middle of his head in the back. In the photos, the blood is flowing away from the middle towards the sides. This shows that Zimmerman was on TOP of Trayvon looking down on him. CSI answer: Zim was initially cleaned up at the scene by paramedics. There are other pics out showing a different blood flow pattern -these were taken on site of the incident. This picture of Zim was taken in an office/building. Plenty of time for him to sit with head in hands as a lot of people do when tired, when injured, when arrested. Bottom line is you are reading way too much into pictures that do not reflect the timeline accurately. How many times are you supposed to let someone smash your head in the ground before you use deadly force to stop the attack? I don't care if it wad a 17yr old or not. The 17yr olds that I am familiar with would not do that to anyone. They are more likely to be the victim if someone else doing it to them to steal their i-phone. If his head was smashed into the pavement for a full minute like he claims his head would have been split open not have superficial scratchs, the longest 1 was an inch. If Zman didnt want to be pummeled by a 17 year old (what a wuss) then he should have stayed in his vehicle like the dispatcher as well as the police that that instruct neighborhood watch volunteers say to. They really need to photo shop this pic. 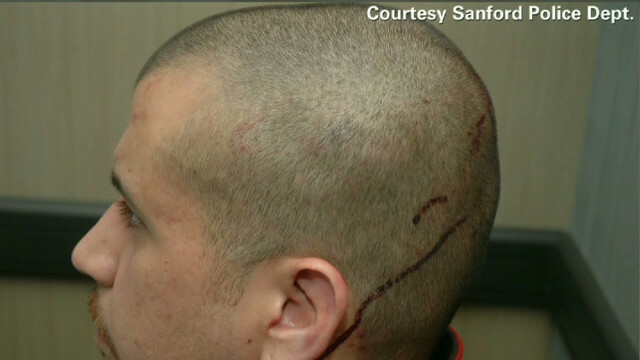 Zimmerman is shown with an orange collar under the 2 streaks of blood... poor baby... NOT! This picture was taken after he was arrested ~ not on the day he was "brought in for questioning". So in short, wrong attire for the time frame of injury validation and inmate clothing. Im black. I support zimmerman. Deal with it. Its horrible tre is dead. But you are NOT taken peoples guns away because of this. Woo ouch! Look at that picture. Bloody. Wow. I wonder how that happened. Let's ask the eye witness what they saw. Don't believe the girlfriends testimony, what else do you have? 911 tapes? Eye witnesses, (not ear witness), photos, forensics, police reports.